I have always tried to make best use of technology for learning. I had experience of tutoring an OU course almost a decade ago with my support for the students provided primarily via forums. The OU team had developed a set of videos to accompany the module. During that time I completed a postgraduate module on eLearning innovation and designed a set of digital learning activities (or “e-tivities”) for teaching creative writing, such as using resources like Flickr to get ideas for character creation. Below I present a number of different technologies and how they support student learning. I begin with the staple of digital learning, the learning management system (LMS), which in CIT is Blackboard. Then I discuss other tools outside the CIT umbrella (i.e. not supported by CIT technical staff), which includes ways of sharing complex programming projects and supporting student collaboration during a) live class exercises and b) group projects. In general terms, the use of the technologies below facilitate online learning and therefore provide access to some students who would otherwise not be able to attend on campus. This could be those with disabilities or those with family or work commitments (e.g. night workers) that would be unable to attend. This also provides choice in how and when students learn. For example, with the live online lectures (recorded with Adobe Connect as discussed below), they are recorded and can be viewed at a time of the students’ choosing. There is also evidence that the facilities an institution provided to students affects their choice of institution (Price et al. 2003), so offering flexible online facilities makes CIT a more attractive prospect. These technological facilities also help students to be more autonomous as David Boud (2012) writes about. Littlewood (1996), in the context of language learning, suggests that autonomy is a progression arriving at the learner making choices and shaping their own learning contexts, effectively determining their own syllabus; a range of technology-enhanced resources helps with students’ autonomy as a learner and autonomy as a person. A number of different technologies were used to support student and offer different ways of learning. Despite its flaws, Blackboard is an effective repository for course notes and the lecturer can also curate additional materials from the Internet, such as Youtube videos and links to third-party tutorials. I have experimented with various folder structures in Blackboard, including a thematic structure, e.g. having a folder for a particular topic to group related lecture notes, readings, videos, etc. But what I have settled on is a weekly folder structure with a description under each folder (e.g. Figure 1). Where a particular resource span 2 weeks, I place it in the first weekly folder and link to it from the second. This approach allows students to easily find notes and avoids a cluttered main content area. It also acts as an overview of the curriculum. I can also add a folder for the next week with a description so students have an idea of what’s coming next. All of this sounds fairly trivial, but I think it makes a big difference compared to other courses I have seen on Blackboard that are confusing to navigate (obviously not EDUC9042, which is very well laid out!). We are mandated to record online lectures. These are delivered using Adobe Connect, which allows students to connect to view the lecture and chat to ask questions, for example. 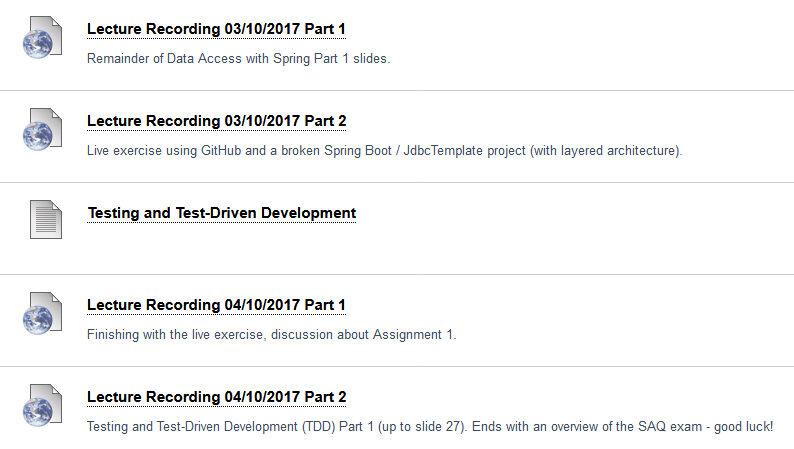 One of the practices I have started to use is to break up my lecture recordings as I change topic. This could be done easily if I was using standard recording software, but this is difficult with Adobe Connect. What I do is stop a recording and inform the students that I have reached the end of a topic and will be starting a new one in the next recording (e.g. Figure 2). Usually there would be a maximum of 3 videos from a 2-hour lecture. This has the benefit of students being able to skip directly to relevant content. The added descriptions help students navigate their way around. Because the part-time online students are often busy in the evenings with work or family commitments, about half of them catch up on the recordings later. This flexibility is important and is one of the types of learning being pushed in government policy. The model works fine as long as there are at least a few students online; the current model negotiated with the TUI (union) is understandable to ensure working conditions of lecturers are not worsened, though it is restrictive in terms of ruling out a lot of potential for asynchronous learning, as per the Open University model, for example. There are advantages and disadvantages to each approach. The students do like the live lecturer, yet still bemoan the lack of personal contact, e.g. having a lecturer there in a lab to more quickly put someone back on course instead of toiling over something trivial for hours (though there can be learning outcomes from that activity too, such as improved research skills and independence). As outlined earlier, I have begun to use Poll Everywhere in a small way and with time over the Christmas break and summer recess, I plan to learn more about it and plan ahead with banks of questions for next semester and beyond. Audience response systems promote active learning because they prompt students to consider prior learning and understanding and enter into discussion, depending on the types of question asked. It also can be used to elicit prior learning from before the module started or from other modules running in parallel – this is a constructivist approach allowing for new knowledge to be linked to old. Another way it can be used is for formative assessment – students can, for example, answer multiple choice questions and gauge their own progress, while the aggregate results can be used by the lecturer to gauge how well a class a a whole understands a concept, allowing the lecturer to revisit topics when necessary. Thus, in that sense it is very student-centred because it is immediately responsive, as opposed to a lecturer discovering a misunderstanding by a class as a whole at a later assessment. GitHub is the leading online source code repository. Many open source projects are hosted there, and there are also many private repositories that are restricted to authorized collaborators.By giving students to opportunity to learn a tool used widely in industry, it adds to the authenticity of the learning environment and the idea that the course is in part an apprenticeship for a role in industry. Herrington (2006) discusses these ideas (again based in large part on the situated cognition and cognitive apprenticeship ideas of Brown et al., 1989, and the idea of communities of practice, Lave and Wenger, 1991). He lists a number features of an effective situated learning environment, such as meaningful reflection and authentic activities. My philosophy is to share my tutorial code and GitHub is the best way to do it. This provides students with code exemplars and scaffolds. One of the challenges of teaching software development at the enterprise level is how quickly technologies change. The Java programming language is pretty stable, but other technologies based on it are not. 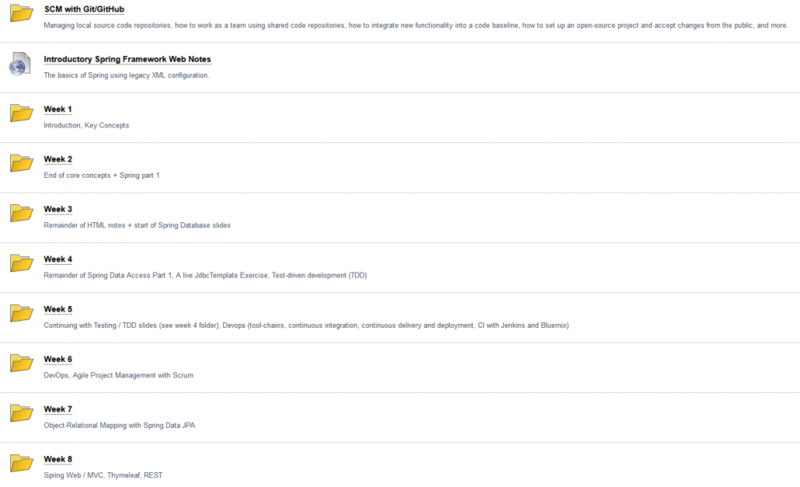 Spring is a Java-based framework I use frequently to teach the principles of enterprise architecture, but the main sponsors of the open source Spring project, Pivotal, are very quick to first deprecate features of the framework and then retire them. This means that one year your notes can be accurate, the next referring to something that has been flagged for removal, and the next out-of-date. This means that if you don’t continually test your code, you can get caught out as students encounter problems – and this has happened this year. I have explained this phenomenon and they are largely understanding. To help counter this issue, I have for the past 3 years used GitHub as a means of disseminating project examples. There is a full history of all changes made as I commit altered code. It is easy for me to make a change to a version number (updating from Spring Boot 1.2.7 to 1.5.8 this year, for example), running the project to see if it still compiles and behaves as expected. Including unit test code helps as you can run these and get a green light if the project still works as expected. By sharing code in this way, students are also engaging with a tool that is widely used in industry (and which also is integral to agile development and DevOps). Students can see the evolution of a project over time as technologies are improved. It also opens up the code to the wider world for others to learn from. Immediacy and peer support are key factors with Google+ Communities. Every CIT student is given an email account hosted by Google. This means they automatically have access to many tools, include social networking and collaboration. Being able to discuss in a social media environment is one way to mitigate feelings of isolation (in my discussion in LO5, the issue of isolation is one reported by some of the online students). However, there is the perhaps odd juxtaposition that for some students being remote but online can actually lead to a greater sense of community – Garrison (2011) writes about the opportunities of e-learning and its “transformative power and capacity to add value” due in part to the “interactive and constructive potential of e-learning”. Trello is a very flexible task management and project management tool that supports many processes or workflows using a card and lane-based user interface. I use Trello to manage my individual work for the PhD with Trello boards for my research process, my game-based learning project and literature review. But it also supports team-based projects and is flexible enough to allow for agile processes like Scrum and Kanban. For SOFT8027, I created a team for the entire class and 3 other teams of 4 to 5 members, which is a good size for a Scrum team. Inviting users and assigning authorizations was quite straightforward. I provided the teams with a template and pointed them towards some online resources for setting up Scrum projects. For the first part of the group project (the initiation phase discussed earlier), I asked them to add stories to a product backlog. Figure 3 has an example assessment output. It is a very visual / at-a-glance platform and allowed me to very quickly see whether the teams had engaged. They all had very satisfactorily and I had confidence at an early stage that they were off to a good start. I had an accompanying rubric with the 3 teams being in or very close to the proficient or exemplary level for each criterion – progress was so satisfactory that I didn’t have to expand beyond the rubric. I had to take screenshots to get a snapshot of where they were and I could not wait around for a non-busy time to do it because it is a moving target. 2 of the 3 teams showed evidence of having gone beyond initiation and had begun to plan the first sprint. This gave me feedback that I hadn’t overburdened the students and that the initiation had worked effectively. As the projects progress I have visibility into their activities. This is very useful from 2 perspectives: a) I can see how they are doing and when we meet virtually, I can give them good quality feedback and they have cards to refer me to, b) I have evidence of engagement when it comes to self and peer assessment; if student A says student B wasn’t pulling their weight, I have some evidence to back up or refute the assertion. 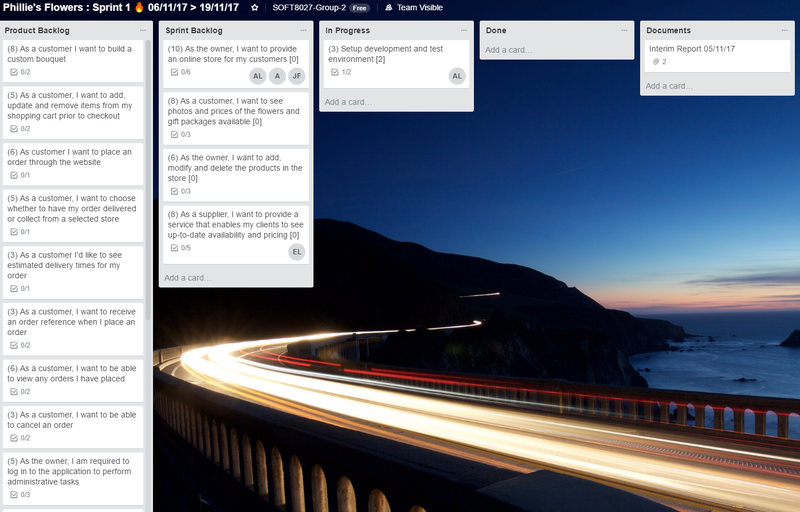 In that sense, because of its visibility, a tool like Trello allows for guided participation (Rogoff, 1995). If the project management was largely email, paper, or otherwise unavailable in the at-a-glance Trello format, it would be more difficult to provide this guidance as a project progresses. Johnson, Johnson and Smith (1998) also suggest that cooperative project work would allow for individual accountability and Trello’s user-based security and auditing assists in two ways: students can see the contribution of teammates; I can see their contribution to see if it is consistent with the claims made in self assessment forms and it can be useful where team members accounts of each others’ contribution is in conflict. Trello shows engagement in terms of teamwork, whereas GitHub shows engagement in terms of technical contribution and adherence to a process / workflow. Figure 4 shows a group progressing well beyond initiation and showing good progress, though it is arguably getting a bit cluttered and some archiving of the lists should take place; I will follow up with the groups and suggest either archiving or moving lists to a new board when they begin to lose the at-a-glance benefit of Trello. Because online students are dispersed geographically and sometimes temporally, Trello allows them to engage in some of the teamwork activities at a time that suits them. For synchronous teamwork, the students use their own choice of meeting software, such as Google Hangouts. I have less frequent meetings with individual teams using Adobe Connect and record the meetings for me and the team. Trello is the type of software used by industry to manage projects – it is relevant / authentic. For example, it is the choice of Nimbus to manage all of their various research projects. It is just one tool that supports teamwork and integrated workflows, but there is clear evidence, from my perspective, of active learning taking place – i.e. there is an awful lot of evidence of doing, researching, problem solving, etc. Use of Trello creates something for the students’ digital portfolio and they can use it as evidence at an interview. Boud, D., 2012. Developing Student Autonomy in Learning. Routledge. Garrison, D.R., 2011. E-Learning in the 21st Century: A Framework for Research and Practice. Taylor & Francis. Herrington, J., 2006, Authentic E-Learning in higher education: Design principles for authentic learning environments and tasks. In: World Conference on E-Learning in Corporate, Government, Healthcare, and Higher Education (ELEARN) 2006, 13-17 October 2006, Honolulu, Hawaii, USA pp. 3164-3173. Johnson, D.W., Johnson, R.T., Smith, K.A., 1998. Maximizing instruction through cooperative learning. ASEE Prism; Washington 7, 24. Lave, J. (1991). Situating learning in communities of practice. Perspectives on socially shared cognition, 2, 63-82. Littlewood, W. 1996, “”Autonomy”: an anatomy and a framework”, System, vol. 24, no. 4, pp. 427. Price, I., Matzdorf, F., Smith, L., Agahi, H., 2003. The impact of facilities on student choice of university. Facilities 21, 212–222. Rogoff, B. (1995). Observing sociocultural activity on three planes: Participatory appropriation, guided participation, and apprenticeship. In J. V. Wertsch, P. del Río, & A. Alvarez (Eds. ), Learning in Doing: Social, Cognitive and Computational Perspectives (pp. 139-164).